An arsonist set fire to Elm Grove Elementary in the early morning hours of Monday, June 7, 1999. Firefighters were on the scene in minutes. Sixty-six firefighters fought the blaze for two hours. The fire destroyed classrooms used by fifth-grade language arts/social studies teachers, two second-grade classrooms and five third-grade classrooms. Smoke and water damage was sustained in other parts of the building. To rebuild the structure, nine classrooms had to be completely demolished, and most of the rest of the structure had to be gutted. The damage exceeded $3.5 million. Two other Humble ISD schools had incidents of arson during that same month. A fire set at Riverwood Middle School was quickly contained, but still suffered in excess of $40,000 worth of damage. At Deerwood Elementary the playground equipment was set on fire. Arson investigators quickly caught the 13-year old arsonist. Two other 12-year old boys were admitted to being present when the fire was started. All three had been former students at the school. The students were processed through the juvenile justice system, and all three were referred to HFD's Juvenile Firesetters program, and also referred to a twelve session counseling program. Only the 13-year old student was charged. Since he had no prior record, he received only one year's probation. 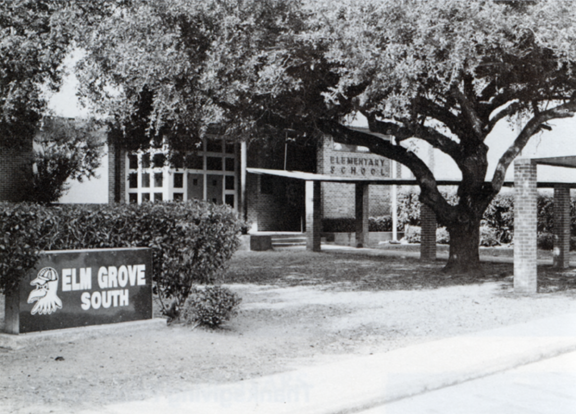 Elm Grove South: The building was too damaged to allow the school to open for the Fall semester. 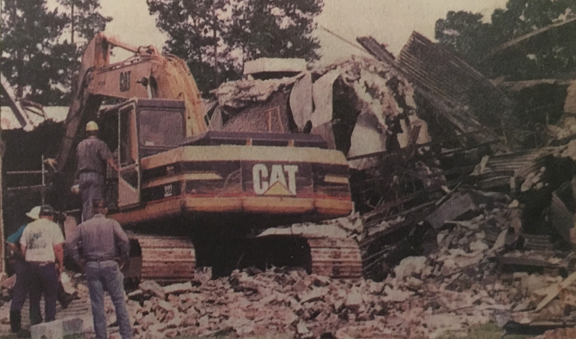 Several parts of the building had to be razed down to the concrete slab. Determined to keep the students and teachers together, in a sense of community, the Humble ISD School Board decided to relocate classes to the old Humble Elementary campus on Charles Street. The district had recently sold that building after opening a new Humble Elementary campus behind Deerbrook Mall. The district leased the old building back from the new owners, and turned it into "Elm Grove South." 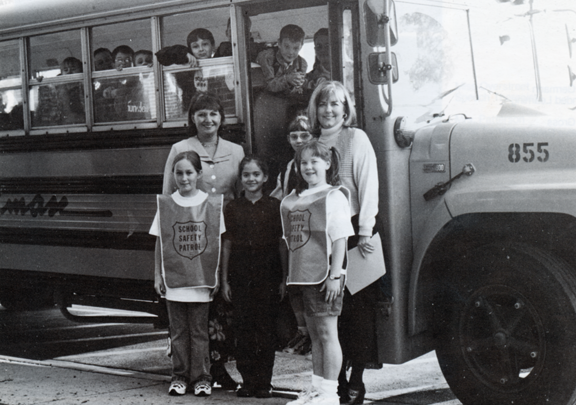 Realizing the difficult situation in having student attend a school so far form their neighborhood, the district provided transportation each day from Kingwood. Community meetings were held at Deerwood Elementary for the Elm Grove parents to meet with district leaders, including Assistant Superintendent John Widmier, School Board member Aaron Clevenson, and Elm Grove administrators Principal Cathy Airola and Assistant Principal Georgia Bartlett. Parent concerns about transportation, safety, and other issues were addressed. Transportation: Principal Cathy Airola explained that Goodman buses had been contracted to transport students from Kingwood to Humble each, and would make normal stops to pick-up students, starting at 7:25 each morning. The buses would be traveling along West Lake Houston drive to avoid Highway 59 and construction problems. Parents also had to option of driving their students to school. The plan was for Elm Grove South to start at 8:30, and it will there will be leniency with the tardy policy. The district ran trial bus rides for the Elm Grove Students July 27-30, to help put them at ease in their new surroundings. They were picked up close to their homes at 9 a.m. and transported to Elm Grove South so they could understand how long it would take to get to school each morning. Once there, they would given a snack, and then taken back home. 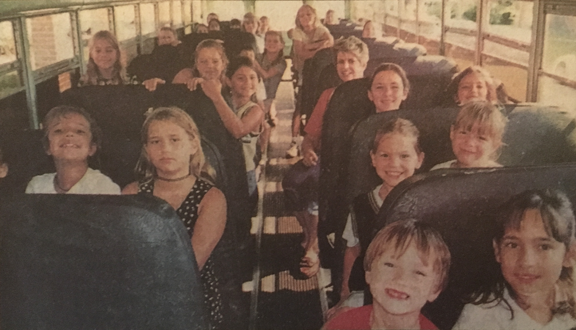 School begins: School started on August 11, 1999 at the Elm Grove South campus for the 600 students and their teachers. Elm Grove second-grade teacher Kara Jennings and first-grade teacher Regina Eakin coordinated the establishment of a fund to help their colleagues purchase teaching materials lost in the fire, and to replace personal items lost by teachers that were not covered by insurance. 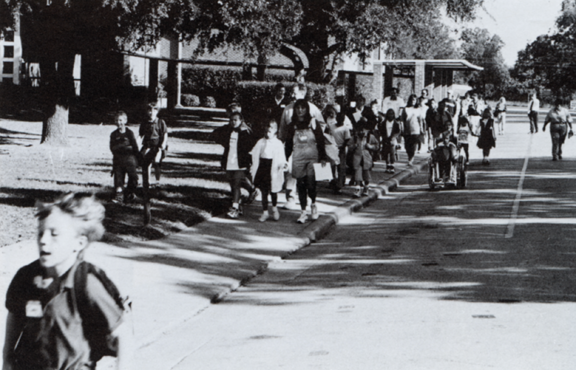 greet their students at Elm Grove South, Fall 1999.
walking field trip throughout the Humble Downtown Area. Everyday Heroes: Principal Cathy Airola and Assistant Principal Georgia Bartlett were nominated by the Elm Grove Elementary faculty and staff for the Kingwood Observer & Sun's Everyday Heroes Award. Both administrators spent the majority of their summer vacation helping students, parents and teacher ease into the situation regarding Elm Grove South. They spent many hours contacting parents and working out the minute detail of the move to the south campus. Return to Elm Grove Elementary: Students and staff returned to a totally rebuilt Elm Grove Elementary in Kingwood at the beginning of the 2000-2001 school-year. Humble ISD plans to have six new schools open over the next ten years. Elementary School #28 will open in time for the next school year (2017-2018), and Middle School #9 will open the following year (2018-2019). The Humble ISD School Board has not announced what the names of these two schools will be yet. However, the schools in Humble ISD are not typically named after people. They are sometimes named for certain areas of town, such as Humble, Atascocita, or Kingwood. More frequently, they are named after neighborhoods, such as Lakeland, Greentree, Eagle Springs, and so on. New Jersey and became Exxon). of the Producers Oil Company's southern division, who approved the donation of the land for the school. Woodward was also the founder of the Houston Gun Club and was once listed as Houston's richest resident. then simply the Hill School. The school was closed in 1932 due to low enrollment. Humble and was recently renovated into a performing arts center. opening in 1873. It was closed in 1903.
history? There's always a chance. still feel about these individuals. If considering people to name schools after, who could it be? Fields Elementary is named for a former board member. He was President of the Humble School Board when Dr. Sconzo was first hired. when it finally became the Humble Independent School District. 3) A respected Principal or other district employee? There are lots in Humble's long history. Arthur Tipton was Assistant Superintendent for many years. at Woodland Hills Elementary and Oaks Elementary. Jack Daniels was a long-time principal in Humble. He worked at many of the early Humble schools. who was principal of the Moonshine Hill School. Elliott Curtis, former longtime Principal of Bender High School and Humble High School. 4) A local community member or public leader. Again, no shortage in our area. There are Humble mayors, prominent citizens, etc. board members, or people who donated land for the location of the school. of choosing good names for schools. Spent a day doing some more research at the Harris County Department of Education Records Storage Facility. Great people there! It's the only place left to find some of the original records for the old Harris County Common School Districts. I found some good additions to my research. I now have all of the School Trustees for Districts 28 and 35 from 1907-1918. I also found just about all School Trustees for District 29 from 1907-1935. I also pulled some documents on Spring ISD (from when they first became Spring ISD), and on District 48...which eventually became North Forest. I stumbled upon the death date for Mrs. Humble while doing research lately. A notice about her death was published in Palestine Daily Herald. Mrs. Humble's niece (Mrs. W. M. Hamilton) lived in Palestine, and was often visited by the Humble's. Mrs. W. M. Hamilton left this afternoon for Humble, in response to a telegram announcing the very serious illness of her aunt, Mrs. P. S. Humble, who visited her here this past summer. Yesterday afternoon, at Humble, Texas, Mrs. Humble, wife of Judge P. S. Humble of that place died after a long illness. Mrs. Humble was an aunt of Mrs. W. M. Hamilton of this city, and during Mrs. Hamilton's childhood was a mother to her, she having lost her mother when she was quite a small child. Mrs. Hamilton went to Humble yesterday in response to a message announcing the serious illness of her relative, but she arrived too late to see her alive. Note: That means Mrs. Jane Markhum Humble died on January 25, 1906. 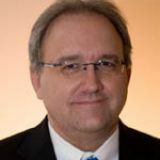 Affidavits were filed yesterday in Judge Maisch's court charging E. M. Isaacs and George Payne with murder in connection with the tragedy of Friday last, in which W. T. Payne and L. C. Echols lost their lives. The cases were set down for a preliminary hearing yesterday afternoon at 3 o'clock, but ere continued until Monday morning at 10 o'clock. Each of the defendants was released on bail in the sum of $300. It will be remembered that Dave and Asa Echols are under bond in the sum of $5000 each on charges of murder morning out of the tragedy. Two Men Killed Instantly and Two Others Wounded, One Seriously. almost instantly and the other two were wounded, one seriously and the other slightly. side, and L. C. Echols and his son, David L. Echols of Humble, on the other. they fell in battle array. head. It is probable that either of the three wounds would have caused death. was in the left arm, and this was probably the first bullet that struck him. J. B. Perkins received a bullet in the right shoulder and another in the side low down towards the groin. lying on the sidewalk where they fell, with their heads in opposite directions and their feet almost touching. dead. A cordon of ropes was instantly stretched about the bodies and this kept the crowd back to some extent. sidewalk to pay the expectant dust a scarlet tribute, and little pools of gore formed about the dead men. they were prepared for burial. where his wound was dressed by Dr. Brumby. wounds were dressed, and where he was reported last night resting easy. Mr. Perkins is well known in the city. stray bullets were in evidence. One bullet entered a show case in a cigar store in front of which Mr. J. B.
killed, and this rumor created much alarm among the friends of the supposed dead man until it was corrected. occurred. It will take the courts to decide whose fault it was. on account of gas discoveries there. The land now owned by the Echols was purchased from Mr. Payne. indictment was returned by the grand jury on evidence furnished by L. C. Echols. The Echols claim that Mr.
states that the indictment grew out of a similarity of marks used by Mr. Payne and the farmer referred to. Mr.
splits in one ear and a crop in the other. All of the parties came to Houston yesterday morning as witnesses and spectators in the trial of young Payne. After talking with the witnesses, District Attorney Len nol pessed the case. The parties left the court room to meet a little later in the street duel above detailed. to see him. Mr. Echols stated that he is 20 years old and that never before has he been in trouble of any kind. - d-- you. I don't want to speak to you." Father replied, "All right, Mr. Payne, " and asked him to excuse him. knowledge, and he asked that his statement appear just as he made it. trouble. Mr. Payne replied in the negative. Copyright © 2017 by Dr. Robert Meaux. All Rights Reserved.